This weekend I had the pleasure of joining about 400 bloggers in Atlanta, Georgia for the Type-A Blogging Conference. The comical thing is that I went with the goal to build my personal blog… and instead I learned so many things that are beneficial to Direct Sales Consultants as well! The Opening Keynote was absolutely awesome – the perfect way to start the event. When his talk was over he mentioned that his books were for sale outside – and I was the first one in line. Think Like a Rock Star provides step-by-step instructions that show marketing professionals how to connect with customers both online and offline to create a truly fan-centric brand. Using case studies of how rock stars like Lady Gaga, Taylor Swift, Katy Perry, and Blink-182 cultivate fans, it teaches readers how to apply those lessons to create brand advocates who will grow profits, improve business frameworks, and contribute more than ever to the success of the brand. It also identifies successful and easily replicable marketing strategies of top brands such as Dell, Ford, Patagonia, and YouTube. 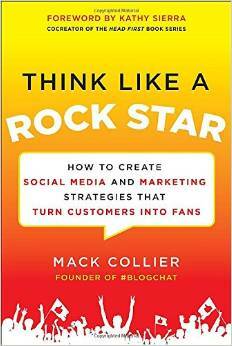 Think Like a Rock Star is an indispensable tool for any marketing professional.